***Sequel to the Agatha and Edgar nominated THE WIZARD OF DARK STREET*** Despite her extraordinary magical abilities and sleuthing skills, Oona Crate’s detective agency has failed to take off. 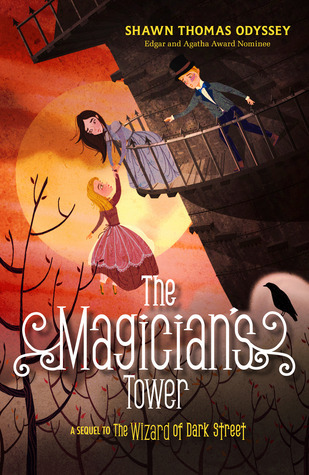 But a new challenge captures her attention—The Magician’s Tower Contest. Odyssey has done it again! I love Oona Crate! In case you didn't read my review of The Wizard of Dark Street (Oona Crate Mystery, #1), let me tell you this again... I love Oona Crate! The Magician's Tower picks up three months after The Wizard of Dark Street ended. Oona had solved her first real mystery and officially started her detective agency while still being the wizard's apprentice. However, very little detecting has actually gone on. Oona is now awaiting the Magician's Tower trials (and hoping for some mysteries as well). The Magician's Tower is a combination of mental and physical trials which culminates with an attempt to open a puzzle box, which hasn't been done in 500 years! Oona's father had made it to the final two and when Oona was a child, she had promised him she would win. With these memories and her father's death, she is driven even further to succeed. Fresh off a summer of a serious lack in detective work, the night before the trials begin, a mystery pops up. Despite the fact that she is very dedicated to the tower trials, she can't help but attempt to find clues and solve this mystery. This book is a truly well-written Oona roller coaster sequel with a smooth blend of trials and mystery. You'll be sucked right into Oona's world and try to solve the clues for the mental trials, as well as figure out the mystery. There is also a lot more magic this time around! Not only are there more spells from Oona, Uncle Alexander, and Samuligan, but there's also a more in depth look at how magic works as well. Odyssey hit it out of the park a second time and I can't wait to read more of Oona Crate and Dark Street!